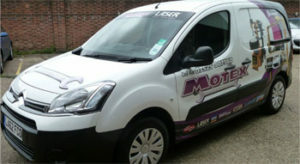 Motex GroupAuto is an Automotive Distributor supplying top quality motor components, lubricants, tools and garage equipment, to dealers in the Essex & East London areas. Pregem Telematics has played a key part in increasing the company’s productivity. With a fleet size of nearly 50 vehicles spread across 5 branches, the company recognised that in order to maximise the productivity and efficiency of every vehicle, it was crucial for Managers to be able to monitor movements of the fleet on a minute by minute basis and in 2010 the company invested in Pregem Telematics’ Vehicle Tracking System. In November 2013 the company completed its migration to the full system, giving them access to driver behaviour, expenses management and vehicle management modules. At branch level, the tracking screen is displayed via wall screens which relay the movements of the entire Motex fleet in real time. Branch managers have an overview of the distribution network, and this enables them to synchronise productivity, allocate all deliveries, create schedules and advise customers on driver ETA’s. Branch managers use reports on route efficiency and driver performance to help lower fuel bills as each branch is responsible for its own P&L. Should the need arise, to aid dispute resolution, Motex also use Pregem Telematics Route Replay function to view exact routes taken by vehicles and provide proof of service to customers. Senior managers in the company’s head office use Pregem Telematics comprehensive reporting system to help them monitor and manage the entire fleet. Scheduled reports detail movements such as out-of-hours activity, and calculate the number of visits to each customer. Reports also give access to metrics on vehicle utilisation allowing for more effective Branch KPI analysis. Before implementing the Pregem Telematics system, Motex GroupAuto where operating at 70% of optimum fuel efficiency, effectively using 30% more mileage than necessary.